A Friendly Universe: Sayings to Inspire and Challenge You - Kindle edition by Byron Katie. Self-Help Kindle eBooks @ Amazon.com. 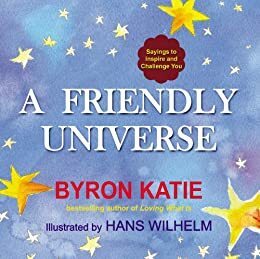 In this vibrant book of inspiring and challenging wisdom, Byron Katie offers powerful aphorisms that can change the lives of readers forever. These delightful “Katieisms” are presented along with full-color, full-page illustrations from celebrated and award-winning artist Hans Wilhelm. This book will brighten the lives of readers who are searching for inner harmony and an end to suffering. 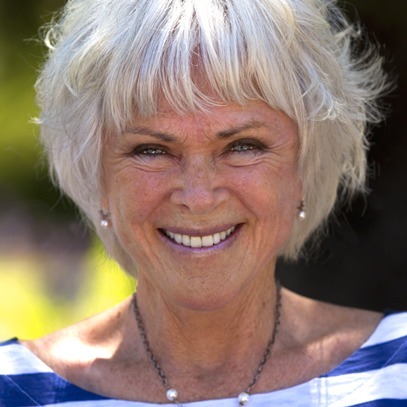 "Byron Katie describes her job as teaching people how to stop suffering. In 1986, she had an epiphany and realized that all suffering, including her own depression, anger, and addiction, comes from believing our thoughts. She delivered a four-step method of inquiry called The Work. It is based onfour questions and has proven to be a life changing spiritual tool for millions. Set to the backdrop of award-winning artist Hans Wilhelm's full color illustrations, this paperback contains inspiring aphorisms from Katie's writings and speeches." Byron Katie experienced what she calls “waking up to reality” in 1986, and since then she has introduced The Work, her method of self-inquiry, to millions of people at public events and in prisons, hospitals, churches, V. A. centers, corporations, universities, and schools. Participants at her nine-day School for The Work and twenty-eight-day residential Turnaround House report profound experiences and lasting transformations. “Katie’s events are riveting to watch,” the Times of London reported. Eckhart Tolle calls The Work “a great blessing for our planet.” And Time magazine named Katie a “spiritual innovator for the new millennium.” Her three bestselling books are Loving What Is, I Need Your Love—Is That True?, and A Thousand Names for Joy. Visit her online at www.thework.com. A beautiful picture book with many of Katie's choicest sayings. You can read the entire book in less than ten minutes. It is not new material, just presented in a visually appealing way, something like a set of inspiring cards put together as a book. However the teachings are valuable enough to reflect on for a lifetime, and I am happy to have it. Please note that this is a special kind of kindle ebook that only works on touch screen devices, not on a laptop. This book is a must for Byron Katie fans and anyone else who would like to create their own "Heaven" right here and now. The illustrations are beautiful and they beautifully support the sayings.If Katie and/or ideas about creating our own lives are new to you, at least check this out. You owe it to yourself. This little, short booklet makes me cry and laugh at the same time. And when I am finished with this wonderfully created WORK, i felt lighter and i can breath much easier. I highly recommend it to everyone! We are all need it! Powerful and deep truths for me that remove the stress of life. I try to re-read daily during difficult times. Awful. Waste of time. Hated it. it's a powerul reminder that life is an inside job. The stories I tell about life are the most important inputs to the life i experience. Simple messages but powerful at changing my perspective on things. Keep a copy on my coffee table. Love her work and this book is an excellent introduction to her work.